Well, we've definitely decided to settle in for a while. It didn't take long for us to feel that this island is the right place for us. It's a good fit, a really good fit. Deb is very happy, and I am VERY happy! Of course, the endless rumors of water and power problems keep us on edge but we feel these things will work out. 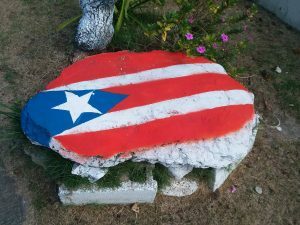 Case in point, the other day someone posted on FB, “rumor has it that the town generators will run out of diesel fuel on Sunday” (this would mean an island blackout). A couple of hours later, “the fuel is on the way from FEMA, relax”. Heavy sigh! I guess we're spoiled but we consider water and power a requirement for long-term living anywhere, so if the utilities were to go horribly wrong we'd have to reconsider this place. But we don't think we'll be stuck making those kinds of hard choices. Fingers crossed. Rock life, for the win! So, settling down, eh? Time to get some STUFF! Aaaaahahahahahaaa, yes!!!! We had some boxes stored at our son Zack's house to be shipped to us once we got here. These were Qty. 8 of the “if it fits, it ships” boxes from US Postal, for $18.90 each for the large size. We made a numbered list of the contents oh so many months back so we had an idea of what was in each one, and that was very helpful. In fact, boxes 1 and 2 were sheets and towels that we don't need so we'll just go through those in August when we go to CO for Zack and Danni's wedding. We'll either store them for later or just get rid of them. So we had Zack ship the other 6 boxes and in spite of all the dents and rounded corners from rough handling, they arrived quickly and survived pretty well. We even had a couple of ceramic coffee mugs and a pint glass in the center of these and they made it crack-free! Island time? These package handlers were in a hurry! We also got everything from tools to sunscreen and other consumables, spices, kitchen utensils, doggie care stuff, a couple of hats, a shirt and pair of shorts. It was a bunch of things that wouldn't fit in our suitcases, or were too heavy. My favorite was the box full of tools. That one probably weighed 20 lbs. by itself. 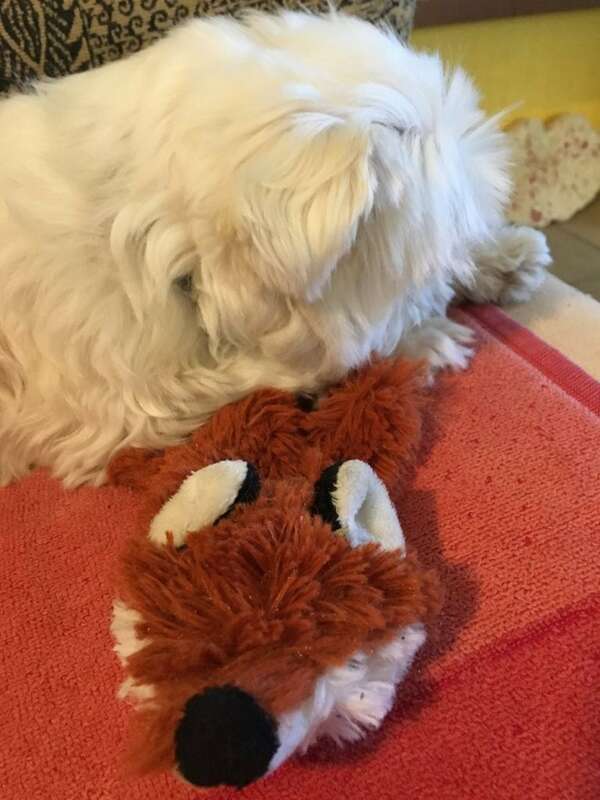 Even the Littles got something - Kirby was so happy to have his Foxy! It's crazy how many things pop to the top of the list once you make the mental leap that you're staying a while. Some of it is just long overdue consumables like vitamins for me and heart-worm medicine for the littles, things that were on the verge of running out. We would buy these items whether we are staying or going. And then some of it is island and scarcity related, such as buying more and better solar lights. We like these inflatable Luci Lights enough that we own three of them now. 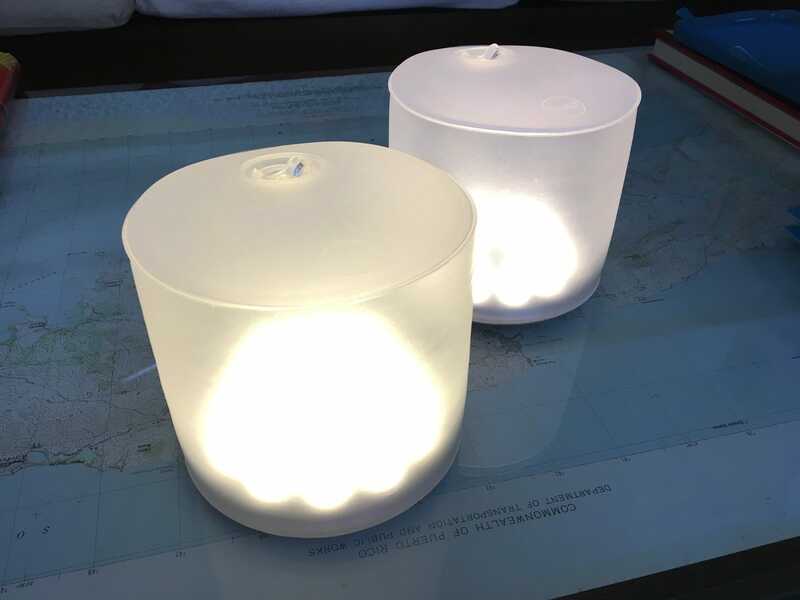 It doesn't sound like a lot of light but they are bright and they are portable, they last all night after being charged by the sun during the day, we can bring them room to room like a candle, and our place is so small they work really well for it. I am looking at some small solar power systems as well, but haven't done enough research to pull the trigger on anything. I'm sure you kneedeepers will forgive us these necessities. Next on the list are the exercise, hobby, and interest items. We bought a couple of yoga mats to do some yoga yes, but also for push-ups (I need to get back to this), sit-ups, stretching, etc. Deb wanted a better bike seat so that's coming. There's also a word-game book for her, and then we get into the fishing gear. I have on order a rod and reel, tackle, a tackle box, all that stuff. It's coming any day now and I'm very excited! I can taste the snapper filets already! I also ordered a toolbox for those tools we shipped from CO.
We ordered so many things that I had to put them on my calendar to know when to expect them, and that is a good thing because they've mostly been getting delayed. Right now, I'm waiting on six packages and they're all late! Don't look at me that way, this is not all my fault. Because of what warehouse they are in, Amazon often breaks up orders into separate shipments so a small order of socks, a light, and a fishing knife, all end up in different boxes and we have to track them separately. So there. 🙂 As for the tardiness, the weather has made for very high seas this week (25' to 30' breakers on shore) so the ferries aren't coming to the island the last few days. There's that, and the fact that Amazon and UPS don't seem to give PR shipments much priority at all, and once the packages pass into international waters over the Atlantic, all that high tech tracking turns very "islandy". You know how USPS tracking normally goes right? "Initiated tracking"... (nothing for 5 days)... "Delivered". Well, UPS here is pretty close to that. I have one, that at the time of this writing, is "due" tomorrow, yet so far it has only gone from California to Nevada. Another one has been sitting in San Juan since last Thursday with a shipping note that says "We were unable to load the package on the plane as scheduled". ??? 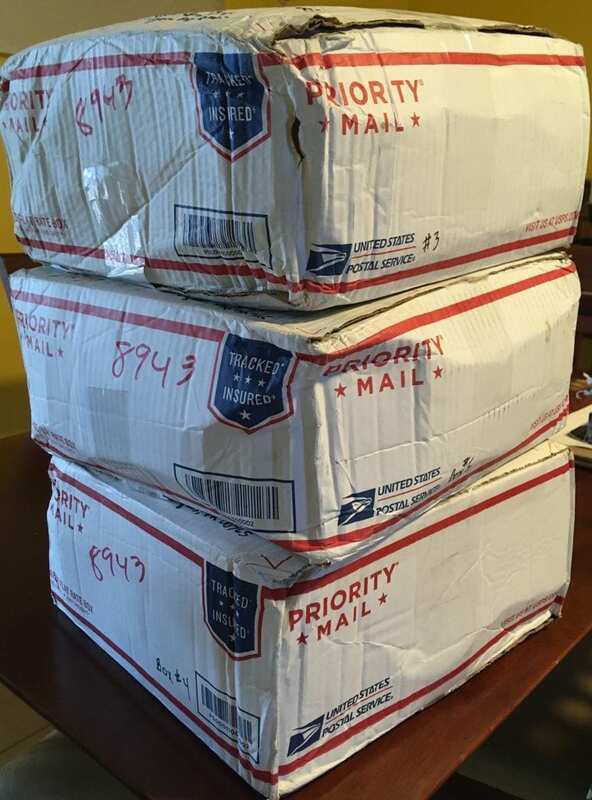 And that's before we get to the USPS and UPS island problems. Not problems really, just small barriers to overcome. Our mailing address is an HC address, which means “Highway Contract”. 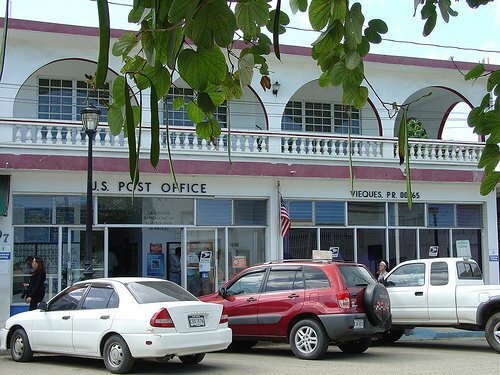 It takes the form of HC # Box ####, Vieques, PR 00765. In case you hadn't heard of them (I hadn't), in the states these HC addresses are typically farm houses out in the boonies where the postal service contracts out the final stage of delivery to somebody else. Here, it's anybody outside of town, which is most of the island. There's a set of keyed boxes on our street just around the corner and the normal mail goes there. Packages won't fit so the mailman takes them to your house. But unbeknownst to us, there is apparently no system that links up your house address with your box number. So our first boxes were coming and we stayed home that afternoon, all excited you know, because stuff! Breakfast and lunch came and went, then 1pm, 3pm, and eventually, we went over to the box only to find a card in it telling us to pick them up at the post office. Huh. So quick we went like bunnies on bikes (with our newly installed racks bought from Amazon!) with backpacks and lots of bungie cords, before the post office closed at 4pm. Did I tell you everyone here now knows us as the people who ride bikes everywhere? "Oh, you're the ones who ride the bikes?" Yes, that's us now just like our friends Peter and Lizzy in Northern CO. Except in Colorado, there are lots of people on bikes. Here, more people ride horses than bikes. On two-wheels, it's pretty much only kids and "unique people", so I guess we've joined one of those two groups. We asked about the non-delivery at the post office, telling the friendly lady our house is on the same street as the boxes and we were home all day. The short conversation went something like this: “He didn't know where you were. Are you on Chulo's street?” “No, we're on the next block over toward the water.” “OK, I'll tell your carrier, he didn't know where you were.” They don't go by street names, even though ours is one of the rare ones with an actual street name and a sign on the corner. But everyone knows Chulo I guess, so that works. Well, we're still waiting to see a box come to the front door, but we think it works! Anyway, it's a good thing we know Chulo also or we wouldn't know where anything is! Lots of times people tell us where they live based on some landmark - the Fort, the old hospital, the house that Guadalupe's mother sold to Mateo's cousin, that sort of thing. Being new, we often don't know where these places are, but if we can find the landmark, and then find the house, we're welcome to stop by! It's not a bad thing BTW, 15 minutes of bike riding each way to town, with a few hills and some loose dogs in between (interval training!). It might help curb the buying habit. But the riding seems to get easier every day, oh well! And on every trip another island local learns a little more about the "unique" people who ride the bikes. So that was US Postal; UPS is the same but completely different. There is no actual system to deliver them to your house so we can forget about that part. And since Amazon ships mostly UPS, this is really our normal method for receiving boxes. We get a text message, “we have a package for you”, and we hop on the bikes and zip into town (2 blocks away from the USPS office) to get it, again before 4pm. A super nice lady Carla works there and she's getting to know us already. It's such a small town atmosphere around here sometimes I feel like I could pick up the phone and ask "Sarah, can you ring up Barney Fife for me?". Since of course, Sarah (living in the 1960s) wouldn't know how to text would she? Actually, the whole idea of landlines is gone here, after Hurricane Maria. The only wires being hooked back up after the storm are power lines. There are lots of wires on the poles, and lying on the ground, draped across bushes and buildings, but they're not getting connected any more. Communication is virtually all done by wireless now, including Internet and television broadcast (which is either done with dishes pointed up at satellites or antennas pointed at the mainland). So in that sense, we're very modern here! ? Anyway, Carla knows how to text and she lets us know we have boxes! Our plan for this afternoon is to ride into town to a waterfront dive bar called Al's Mar Azul. We'll have a drink, and wait for the text from Carla. Then we'll wrap things up at the bar, go get our new stuff and take it home on our bikes. There is no “seller's regret” here BTW, for all that stuff we got rid of (cars, bikes, furniture, electronics, tools, knick-knacks, art, kitchen stuff, etc.). It enabled our adventures! Well actually, not having all the stuff enabled our adventures. And keeping it all, then storing and shipping it to the islands just doesn't pay off, not at all. We're not re-purchasing things we sold anyway, it's a different lifestyle we're buying for. It's not as if we're going to re-buy all those thousands of items. We're going to get what we need, what makes us happy here, and nothing else. OK, there is one thing. We walked down to the hardware store and bought a scale. Deb said since we're not going to fly for a while we won't be able to weigh ourselves on the airport luggage scale so this became a necessity! For those keeping track at home, we've shipped from CO or purchased here: bikes and accessories, fishing gear, workout gear, tools, a few dishes and utensils, books, and some general survival items. But do not fear this newly awakened commercialism that's been lurking deep down in our souls! We've already decided that anything that doesn't fit in our suitcases IF and when we leave, will either be sold here or given away. This stuff ain't coming along for the next ride! That ought to keep us in check to some extent at least! Oh, and then there's the car, the future car whatever it may turn out to be, but that will have to wait for another blog post. Oh, and don't tell Deb about the boat, OK? It's just between us, wink wink. TODAY'S SPECIAL: “You Can't Always Get What You Want”, by the Rolling Stones! Because if you try sometime, you just might find, you get what you need. I think you are becoming a legend. An island living expat legend. Nice. Ha, a legend in my own mind! "Today’s Special" was the best laugh of the day. No, wait. "Interval training" was the best laugh of the day. OK, it’s a tie. Glad you liked ’em both! As for the interval training, it may turn into some kind of shoulder workout. I’ve sworn to use my bike pump as a weapon if need be! But so far the dogs just like to chase us, nobody has been snapping at us. The telephone operator was Patty Sue, not Sarah. There were no women with just one name in that era in that part of the world, thus Betty Jean, Mary Margaret, etc. I had a friend named Baby Ruth, swear to God (or the gods depending on your leaning). In the deep, Deep South, it was the same with boys. Thus Jim Bob for James Robert. Well you get the picture. So, great blog Normie Conrad. Are scooters popular on the island? Your bikes are much healthier but a used scooter might be better than a car for longer distances. 125cc to 150cc is plenty big enough to ride 2. Would still need a milk crate on the back for the pups and cargo. Hi Casey, scooters and golf carts are not too popular, maybe they aren’t macho enough for this culture? They do exist and we did consider them but the bad paved roads and dirt roads really limit their usability. And scooters just become a bicycle replacement. Almost anything we can do on a scooter we can do on a bike, and you still get wet when it rains, so we nixed that idea. A car OTOH allows us to travel at night (we refuse to be on these roads at night, on bikes), in bad weather, haul dogs and gear at the same time, and maybe something big like a SUP or a canoe. And they’re cheap here. Beat up, but cheap. A couple of people do have these BTW: https://www.youtube.com/watch?v=htf1yoxH3CQ but they are very limited in what they can do. Cool though!